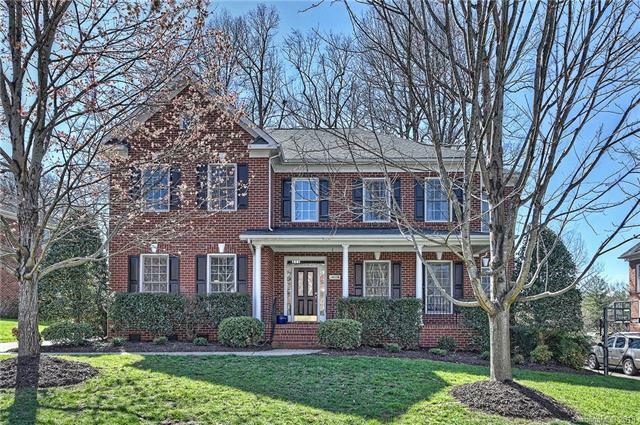 14116 Bramborough Road, Huntersville, NC 28078 (#3365036) :: Robert Greene Real Estate, Inc. Fantastic FULL BRICK home in the RESERVE at Northstone. GORGEOUS NEW HARDWOOD floors, new paint & TILE in the Bathrooms. SPACIOUS & OPEN FLOOR PLAN. Kitchen with Granite, Island and GAS COOKTOP. Large Great Room with Gas Fireplace. BEDROOM & FULL BATH on MAIN and MAIN LEVEL office/living room/flex space. Upper Level features LARGE master retreat with UPDATED ensuite, dual sinks, jetted tub, FRAMELESS glass shower and walk-in closet. 3 Secondary Bedrooms including a HUGE BEDROOM/BONUS option. THIRD FLOOR has another bonus/media room option, TONS of STORAGE!!! Enjoy relaxing on the spacious back deck, overlooking the fully fenced, tree lined backyard. NEW ROOF 2013, HVAC 2013/2017.